by Eugenia Talbott Archives - Art Matters! Artist Eugenia Talbott Adderson with “Lunatic Fringe” on easel. Lunatic Fringe—the legendary saddle bronc and true rodeo celebrity—has a huge fan base, many of whom I’ve had the pleasure to meet this year in Wickenburg, Arizona. He’s a big, powerful horse, and stunningly beautiful. 15 years old, 1325 lbs. and 15.2 hands. I’m told he’s a gentleman, but that he took his job seriously in the arena. He appeared 11 times at the National Finals Rodeo (NFR). Bruce Hunt, father of Anna Hunt and soon to be father-in-law to Matt Burch, commissioned my painting of Lunatic Fringe. Matt and his brother Chad own Burch Rodeo Company and Lunatic Fringe, who is said to be one of the best saddle broncs in generations. It was a fun project and an honor to paint this handsome stallion. Lunatic was retired after this year’s 2016 NFR at the New Year’s “Buckin’ Ball” in Gillette, Wyoming. Now he spends his days with his mares in Gillette. Rodeo News magazine featured Lunatic Fringe and Burch Rodeo Co. on their April 2017 cover. They followed the piece with a special review about me, my art, and the painting I created of the Burch’s famous horse. You can see it online at rodeonews.com. 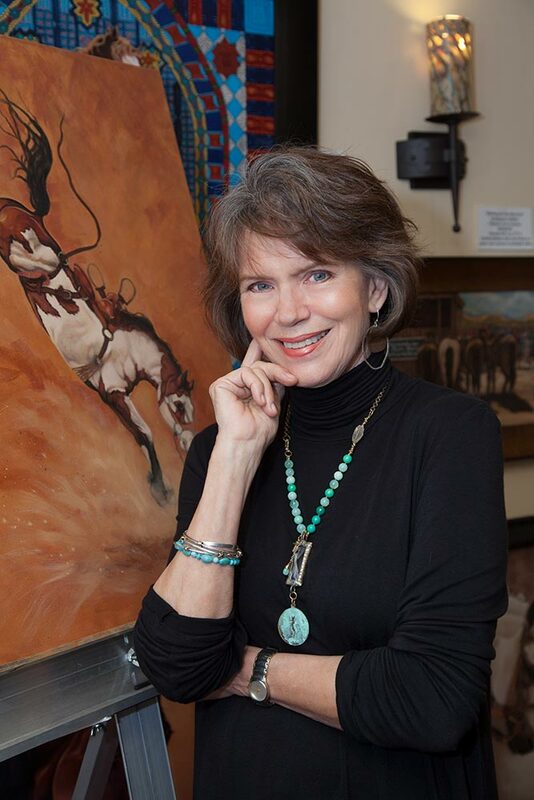 I’ve had my winter studio for the last two years at the Rusty Rooster in Wickenburg, AZ. The owner, Gerri Warren, has become a great friend. Rusty Rooster is where I painted “Lunatic Fringe” and my painting of a longhorn bull that was entitled “Don’t Call me Buttercup!” by my friend, Charles Sampson. Charles is a World Champion bull rider, inducted into the Cowboy Hall of Fame, and holds countless other honors. Both paintings are available in limited edition prints at Rusty Rooster (928-684-6884), my website https://talbottstudios.com, and via my Facebook email address. The “Lunatic Fringe” print on canvas measures 20″ w x 25″ h.
View all Eugenia Talbott Adderson's posts. 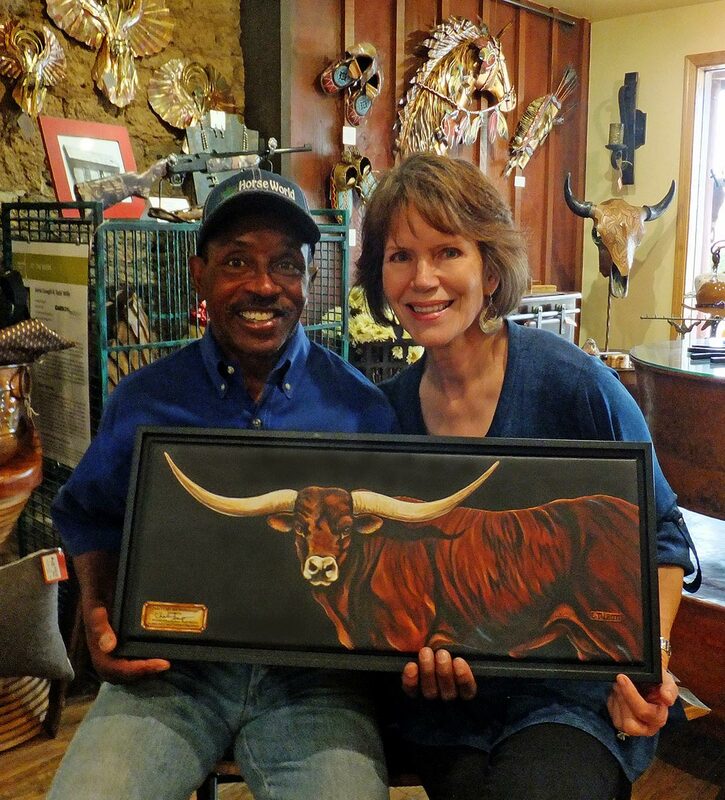 My newest piece, an oil painting of a longhorn bull, was recently entitled, “Don’t Call Me Buttercup!” by 1982 World Champion Bull Rider Charles Sampson. Charles was the first African American cowboy to win a world title in the Professional Rodeo Cowboys Association (PRCA). He retired at the Dodge National Circuit Finals in Pocatello, ID, in 1994 and was inducted into the Pro Rodeo Hall of Fame in 1996. It was a great honor to meet him, and a greater honor still for him to give me the title for my painting! The original of “Don’t Call Me Buttercup!”—my new painting named by Charles Sampson—was purchased in February 2017. However, prints are now available. Please contact me at [email protected] for more details. Webmistress Hannah West will add it to my website sometime in April. Print Sale from Eugenia Talbott for Holiday Earlybird Shoppers! I hope your summer has been a good one and that you are settling into the fall season. This summer has been a busy one for me as I recovered from neck surgery and finally returned to my studio after a long absence. Should you need early bird Christmas or holiday gifts, I’m offering a 25% discount, plus handling and shipping, on all my prints – paper or canvas. If you decide you would like to order a print, be sure to let me know by September 20th so I have time to take care of your order. My Baby Sis is getting married and I must be there to help her on her big day, plus celebrate with my son Talbott and his wife the birth of twin granddaughters! Please go to my website to see my new selections. http://www.talbottstudios.com/ For your convenience I take Visa, Master Card, American Express, personal checks, and always welcome cash. My work is currently being exhibited through the end of the year at Aurora Vines tasting room, located at 2275 Pioneer Rd., Talent, Oregon. The tasting room is open Thursday through Sunday from 12 noon to 5 pm, and their phone number is 541-897-0592. The owner, Vicki Nickerson, has one of the top vineyards in our area, producing award winning wines. I hope you will find time to visit, see my work, and enjoy some fine southern Oregon wine!